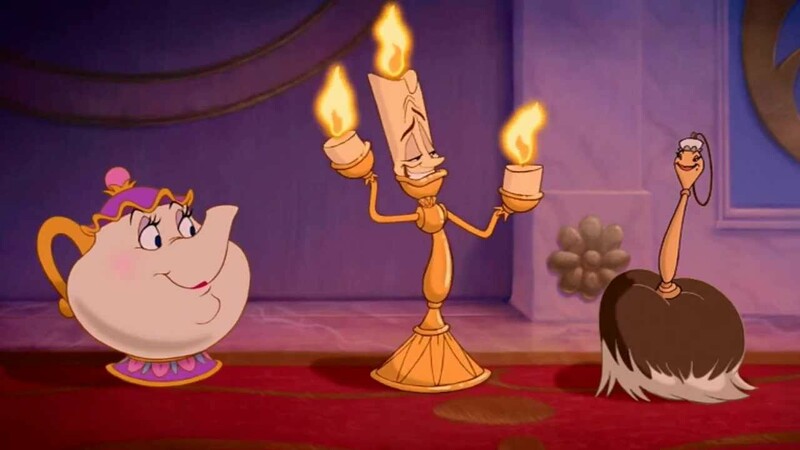 Mrs. Potts, Luminaire , and Cogsworth, longed to be human again. They were not content to be innate objects for eternity. They yearned to be who they were created to be before the curse. How like us! Because of sin we are not who God originally created us to be. We were created to have a relationship with God! Now there are broken families, we must work hard, and communion with God is severed. God created the world beautiful and perfect. His fingerprints were undeniably over everything. But then we chose sin and the curse broke forth. “Cursed is the ground for your sake; In toil, you shall eat of it all the days of your life. Both thorns and thistles it shall bring forth for you, and you shall eat the herb of the field. In the sweat of your face you shall eat bread till you return to the ground, for out of it you were taken; for dust, you are, and to dust you shall return” Genesis 3: 17b-19. When Jesus died on the cross, He paid the price of our sin. When He cried “It is Finished”, the curse was broken. Jesus rose from the dead and declared that the curse of sin was broken. When you place your trust in Christ, the sin of curse is broken and you are free in Christ! For those who know God there should be a longing for when He comes back to rapture His church. “Now I saw a new heaven and a new earth, for the first heaven and the first earth had passed away. Also there was no more sea. Then, I John, saw the holy city, New Jerusalem, coming down out of heaven from God, prepared as a bride adorned for her husband. And I heard a loud voice from heaven saying, “Behold, the tabernacle of God is with men, and He will dwell with them, and they shall be His people. God Himself will be with them and be their God. And God will wipe away every tear from their eyes; there shall be no more death, nor sorrow, nor crying. There shall be no more pain, for the former things have passed away”. Rev 21:1-4. Only the love of God can break the curse of sin. I think of the song “Human Again”. As believers and followers of Jesus our eyes should be fixed on Him and when He comes to wipe away every tear and make everything right. Because even when you chose to follow Jesus you still must battle the curse of sin. But when Christ returns the all will be as God intended. “And they shall rebuild the old ruins, they shall raise up the former desolations, and they shall repair the ruined cities, the desolations of many generations…Instead of your shame you shall have double honor, and instead of confusion they shall rejoice in their portion. Therefore, in their land they shall possess double; everlasting joy shall be theirs” Isaiah 61: 4,7. *Photo taken from Google images/ Youtube.